Pac-Man, Madonna, Max Headroom, The Sugarhill Gang. Take folks back to the most awesome decade with help from the 80s Music Postcard Mailer! 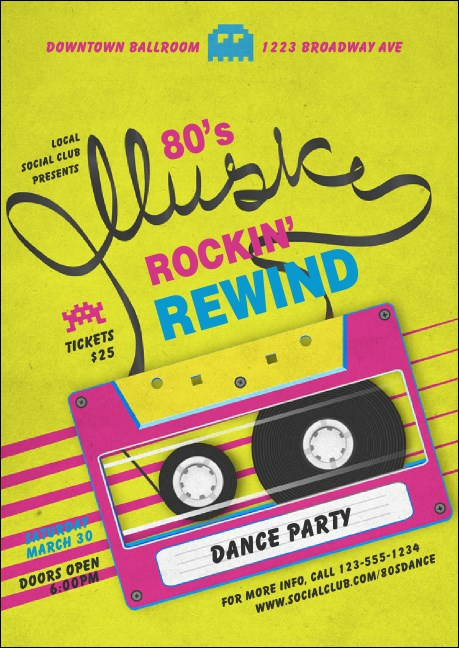 Its totally tubular, neon colors stand out, and its mixtape graphic will stir all kinds of nostalgia as well as an impulse to save the date. Customize it to your needs and upload your mailing list. We’ll print and send out via USPS First-Class Mail. Dimensions are approximate: 4.25" x 6"
Reach your prospective guests with a standout postcard design! Find a bunch on TicketPrinting.com.